Mesothelioma survivor Jim Huff always wanted to learn how to play the guitar, but he never quite found the time. Work and family obligations always took precedence — until now. A diagnosis of malignant pleural mesothelioma 10 months ago finally made it happen, leading him into the music store where his guitar lessons began and his world expanded. Eric Clapton, take notice; Jim Huff is on the rise. Huff, 67, was devastated by his original diagnosis, but he has been energized by his success with medical marijuana, buying him time to learn new riffs on his 12-string guitar. Tom Petty’s “Free Falling” never sounded so good. Since he started with the cannabidiol-rich marijuana oil (CBD), his CT scans have shown no new tumor growth, and even a slight regression. Originally, he was not a surgical candidate, and the thought of debilitating chemotherapy side effects did not appeal to him. So he explored alternatives, settling on medical marijuana. Huff was fortunate to live in Northern California, where medical marijuana is easily available. He stops now once each month at Jayden’s Journey, a well-known marijuana dispensary in nearby Modesto. The CBD oil is the nonpsychoactive concentrate extracted from the marijuana plant. He takes it twice each day with no negative side effects. He takes the THC oil, which is the psychoactive concentrate, just before bedtime and sleeps off the high it typically provides. Huff plays golf regularly, but he hasn’t improved too much since he retired. “I get as many swings as I can for the dollar,” he said. He cuts his own grass with a push mower. He puppy watches for his daughter, who is a school teacher. He builds furniture for his wife. He strums the 12-string, and still takes lessons. He eats junk food, and he likes it. Jim Huff now spends his time perfecting his guitar skills and traveling with his wife. His pace has slowed, but his life hasn’t changed much since the diagnosis. Huff spent his working life driving a truck, retiring in 2011 after 42 years. He was diagnosed with pneumonia three times in the last 20 years. And he thought this was No. 4 when he first noticed a shortness of breath a year ago. He had almost drowned on his vacation in Mexico when he dove into the water and sank like a rock. His lungs already were filled with fluid, giving him no buoyancy to swim. He returned home and went straight to the doctor. 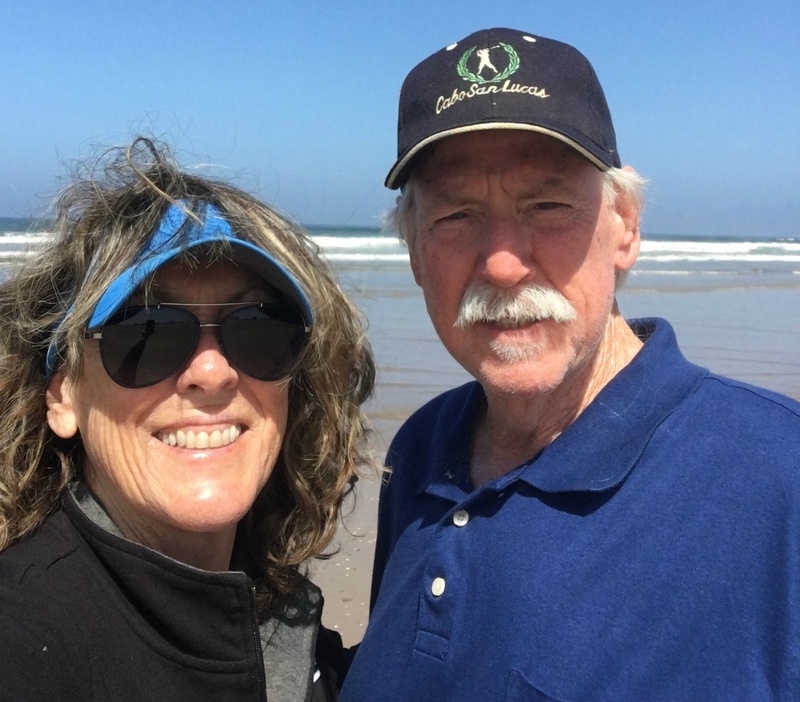 The biopsy that eventually confirmed the diagnosis was performed at Dameron Hospital in nearby Stockton, a place he picked because he had been there before — and loved the food they served. It was reconfirmed at the University of California-San Francisco Medical Center, a top-rated specialty center where he has enrolled in a clinical trial that hasn’t started yet. Two months before he was diagnosed, his sister-in-law announced she had lung cancer, and they often talked about the fight they would wage together. Unfortunately, she died not long ago, leaving him to ponder his future. Shortly after the initial diagnosis, his wife convinced him to sell his 2008 Shelby, a high-performance sports car that he had coddled like a baby for years. It’s a move he now regrets. Fortunately, he sold it to his brother, and discussions have begun about a possible buy-back. The price is still being negotiated. He also has an eye on his next guitar purchase, too, possibly a Rickenbacker, the premier guitar brand used by stars with a future.